Some bugs wear you down, acting as an obstacle to your enjoyment of the game. Others? 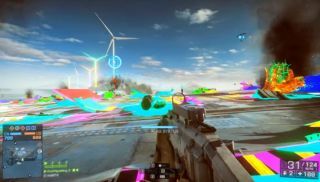 Well, let's put it this way, if this Battlefield 4 glitch was introduced as an optional club mode, I'd happily spend some time in its psychedelic, strobing company. Only, I'd probably have to limit it to 15-minute bursts before needing a lie down and an extra strong Paracetamol. So again, just like a real club. As far as I can work out, the fault - uploaded by YouTube user 'Fruchtpudding', and posted to the excellent subreddit r/GamePhysics - was the result of a Nvidia rendering glitch. Moreover, it seems that the issue was fixed with a driver update issued on the day of BF4's release, thus consigning disco mode to the annals of amusing bug history. Meanwhile, in DICE's continued quest to sweep out the more serious bugs of Battlefield 4's launch, they've released a "zero-downtime" Battlelog patch, updating the website's server browser and profile viewer. You can see its full fixes and features here .